It's Facebook Fridays! for July 6, 2018, and with some luck, you can turn your dreams into winning numbers! The Lucky Mojo Curio Company is holding a random drawing to give away 6 highly enlightening spiritual supply prizes to help you catch a winning number. 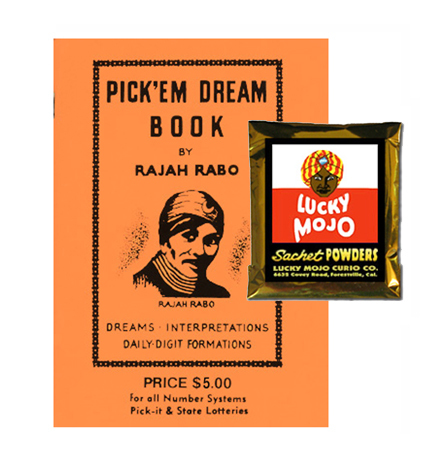 This week, each prize recipient will receive a copy of Rajah Rabo's classic "Pick 'Em Dream Book" plus a packet of hand-made Lucky Mojo brand Lucky Mojo Sachet Powders, to dress the lottery tickets to which your dreams will lead you. First thing tomorrow morning, we will select SIX winners at random, announce their names here, and ask them to message the Lucky Mojo Facebook Page with their mailing/shipping information. Don't forget to go over to Facebook and enter this contest. We have new winners every week. We have a winner! In fact, we have 6 lucky winners! Our Facebook Fridays! winners for July 6, 2018 are: Jennifer Hayes, Jamey Stevenson, Rosa Lopez, Erin Tompkins, Michaelle Senecharles, and David Shi.